We are recognized as reliable Electric Platform Truck Manufacturer and Supplier in India. The Electric Platform Truck, we supply, is engineered by the experts in the most advanced manner. This Electric Platform Truck has several features that make it suitable to be used for various material handling requirements. 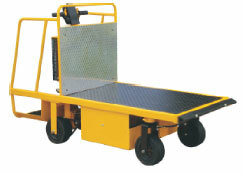 The Electric Platform Truck, we supply, can be availed from us at the market leading price. The transmission of power from the drive motor to the drive wheel takes place via a strong roller chain. The steering handle, which is placed conveniently to the driver, is in connection with the steering wheels via the steering column and a geared chain connection. This makes maneuvering very easy. Black, super soft, semi-solid and thus puncture proof tires. The standard model has a platform of strong, waterproof plywood with non-skid coating. Platform with stainless steel plate or a double platform is available for special versions. Rubber bumper is mounted in front. Operator platform ladder steps are provided facilitate â��Order Pickingâ�� from high shelves up to 2.5mabove floor level. The towing eye that is welded directly on the operator platform is situated 140 mm above the floor. This option increases the utilization degree of PEPT considerably, for towing operations PEPT is a light, maneuverable and battery operated platform truck. It is very suitable for driving in stores and warehouses and it travels rapidly and silently. PEPT is constructed for order picking in long aisles with high shelves for which purpose the truck is equipped with ladder steps. PEPT ensures a good operating economy especially because of the electronic speed control. 2 x 12 V or series connected traction batteries of 175 Ah.